Gravity Rush 2 is out today on PS4. I had mixed feelings about the game in general, but I do like a lot of things about it and it’s definitely more fun once you get the hang of it. To that end: some tips! Let’s do this. Sony released a short two-part animated “overture” that doesn’t exactly make Gravity Rush 2's story EASY to follow, but it does fill in a few blanks from the time between the first game and the second one. It’s also fun to watch, and not very long. Give it a whirl while you’re waiting for the game to download. Take your time and explore. And get gems. Don’t rush through the story. It’s tempting to hurry through Gravity Rush 2’s main story missions, but I found that to be a much less fun way to play the game. Anytime I slowed down and did sidequests, challenge missions and treasure hunts in between story missions, I found I was having a much better time. Furthermore, many of the side missions flesh out the supporting cast in ways that’ll make later story developments have more emotional impact—or just make sense in the first place. You’ll also get a lot of talismans by doing side stuff, and those can make your life a lot easier as you go. Don’t worry about getting locked out of side missions, though—if the story progresses past one, you can still do it, it’ll just be framed as a flashback. 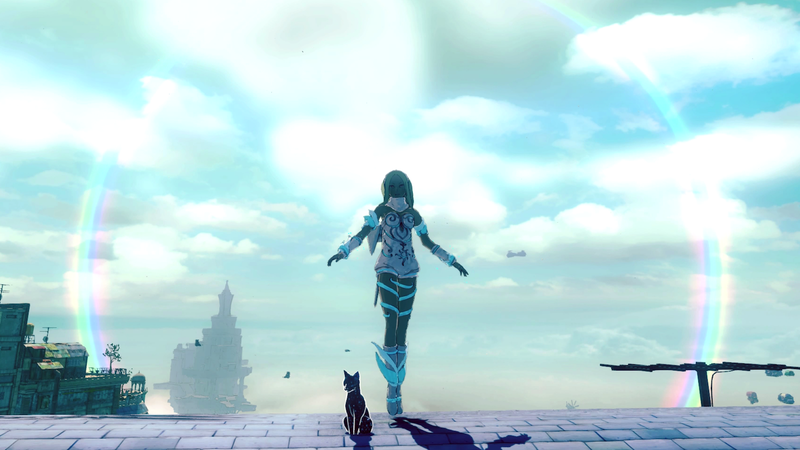 If you didn’t play the first Gravity Rush, know that there’s a pronounced learning curve for this game. Practice floating around the city for a while, and get used to the quickly reorienting yourself to move sideways, straight up, or upside-down. The most helpful thing to bear in mind is that you’re never actually flying—you’re falling. That won’t always help you keep your head in the middle of a chaotic boss battle, but it’s good for getting started. Click the stick to recenter. The right thumbstick is very much your friend in Gravity Rush 2. You can click it to recenter the camera at any time, and believe me, it will make your life a lot easier if you remember to do so. The camera will gradually twist and spin as it tries to keep up with Kat’s movements, and you’ll probably find yourself playing with your head cocked to the side. Anytime that happens, click the stick. Boom, back to normal. Spend some time in first-person. By pressing left on the D-pad, you can switch into first-person view. You can use this for pretty much anything, though it does make it harder to fight. It’s really fun to explore the city in first-person, and can actually be helpful for missions where you need to spot a missing person or match a location up with a photo. Don’t be afraid to set the difficulty to easy. There actually isn’t a huge difference between Gravity Rush 2’s easy and normal difficulty settings. (Part of that is because the irksome insta-fail missions don’t really work any differently on easy.) It’s actually kind of nice that the game isn’t a cakewalk on easy, however, since if you’re feeling frustrated you can kick it down a notch to make things just a tad more manageable without feeling like you’re missing out on any challenge whatsoever. Unless you’re a maniac who likes motion controls, I suggest turning them off once you unlock Kat’s gravity shifting powers. It’s hard enough to keep your head without motion controls changing your aim at the last minute. While playing the first Gravity Rush on the Vita, I almost never used Kat’s gravity slide. It’s much easier to get to on a standard DualShock controller, however, and I recommend using it often. It’s a great way to get around during open-area fights, and can be a good complement to Kat’s jumping and flying abilities. Don’t underestimate how fast she can move on the ground, even over short distances. Mash the stasis field to deal with mobs. It’s easy to fall into the habit of just gravity-kicking your enemies until they go away. That’s a viable way to play, but Kat’s stasis-field projectiles are a really powerful weapon, particularly for dealing with mobs of soldiers or other small enemies. You can actually pick smaller enemies up and throw them at one another, which lets you clear out a dozen bad guys in a matter of seconds. Projectiles are also very helpful for some bosses, and will let you do more damage more quickly without flying yourself up to a boss’s weak spot and putting yourself in harm’s way. Use the stasis field often, and unlock the first stasis field boost—which lets you lift an additional object—early. Focus on big enemies first. This is a time-tested video game rule but a good one to keep in mind during Gravity Rush 2’s more hectic fights. If you’re fighting a flock of goons and a larger monster or mech enters the fray, divert your attention to the bigger dude ASAP. It’s often only a matter of time until a second big’un turns up, and your life will be much easier if you’ve cleared out the first one before that happens. Use the drop-kick to get to the ground. One of Kat’s early “combat” upgrades is a drop-kick that causes her to flip sideways and drop her leg to the ground. (It’s got different names depending on the style you’re using, but you press X + Square to do it.) This is helpful in standard ground combat, but it’s also useful for pushing Kat toward the ground while she’s in midair. It can can be very frustrating to feel stuck in midair when you want to get to the ground, so use that kick to speed things along. Switch styles to move faster or slower. Midway through the game you’ll have unlocked two additional fighting styles—the lighter Lunar style, and the heavier Jupiter style. Lunar style is a lot of fun both during traversal and in combat, mainly because it has a teleport kick that auto-targets enemies. However, Lunar style makes Kat lighter, which means she’ll move around more slowly in general. If you want to get somewhere in a hurry, quickly switch to Jupiter style, then switch back to Lunar style before you land. In combat, Jupiter or Normal style can help you get to the ground faster than staying in Lunar style. I got used to flicking the touchpad to switch between styles, but experiment with the alternate control styles to see if you can find one that you like. Part of the fun of Gravity Rush 2 is finding funny new outfits for Kat and taking selfies all over town. It’s also fun to take on serious story missions while dressed in a ridiculous outfit. You unlock a costume or two through the main story, but most of them are tied to sidequests. Here are some sidequests you can do to get new outfits: A Legend is Born, An Angel Named Double-Cross, Forbidden Games, Hands Up, Hands Out, and Find The Idol. You also get to carry over some outfits from the first game if you have a save file from the PS4 version. Hope those tips are helpful! If you’re playing and have any tips of your own, I hope you’ll share them down below.